Hi! I'm Gillian – a designer by training, a teacher by calling and a maker of things by nature. Here are some Little Pieces of Me that I want to share with you. My trip to the southwest earlier this month was great! And so inspiring in many ways. Right off the plane, Sheila and I went to the Desert Botanical Garden in Phoenix. I've never been to Arizona in May and so I was surprised by the amount of blossom everywhere. And the cactus were in bloom too. By the way, there is a very nice new restaurant there called Gertrudes. Lunch there was a terrific way to start off our holiday. Just at the entrance to the Gardens was this display of cactus, succulents and other plants in big pots. I saw similar things everywhere we went. Made me want a little version of this at home! Of course, some climate variation had to be considered! 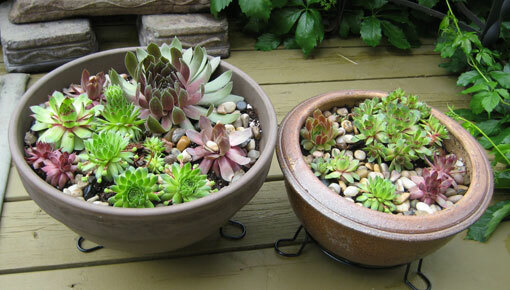 Succulents (vs Cacti) seemed to be the way to go, seeing as they tolerate extreme heat and cold, and grow through times of both drought and moisture. Which sort of sums up the annual weather picture around here! So, I rounded up some pots, dug a few 'hens and chicks' (various kinds of Sempervivum for those of you who like to know these things) out of the garden, picked up a couple of other prime specimens at my local nursery and got to work. 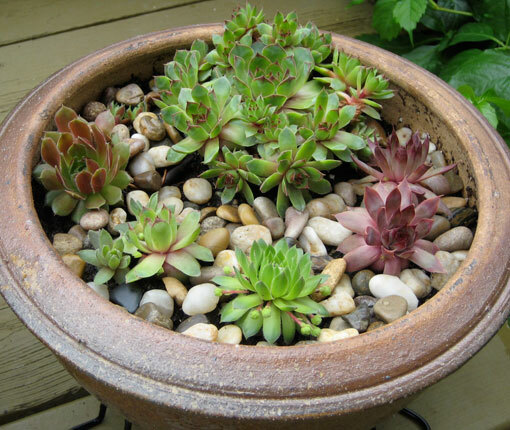 The only thing you really need to remember when making a planter like this is good drainage. Both the big ceramic bowls that I used have drainage holes in the bottom, and I added a thick layer of brick chips and stones. A light soil is also a good idea (although these things grow in just about anything I think). 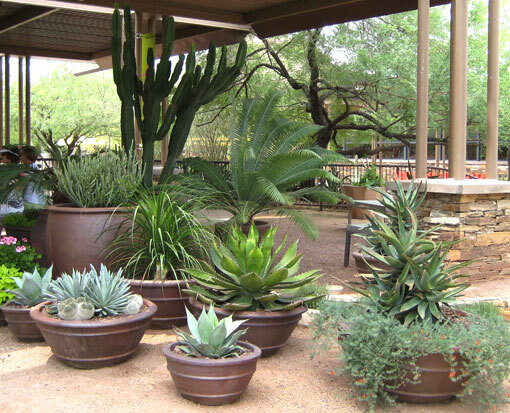 So either use special cactus soil, or mix some sand into regular potting soil. I also picked up these pot stands at Dollarama for extra drainage. And thank goodness! We've had 50-60 cm of rain over the last 24 hours! Check out the big guy in this planter. It's almost 20 cm across. And just to its left, one of the green varietals is already sending up a bloom. These start to look very alien, very quickly. 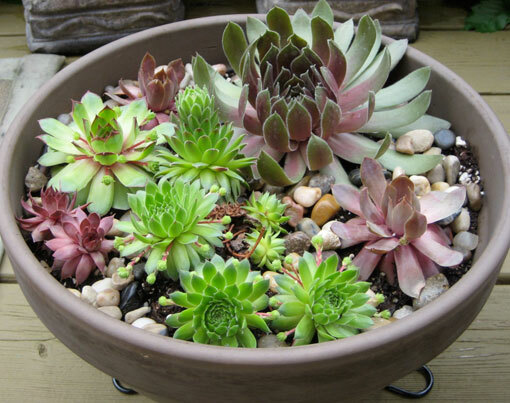 The plants will spread so the bowls will be well filled by the end of the summer and may even need separating. By the way, these plants are hardy to about -30C. So I'll be able to overwinter them. OK, so it's not the Botanical Gardens, but with a big pot of portulaca and maybe a couple of geraniums I'll have a pretty (and heat resistant) display on my hot and sunny upper deck this summer. Come on over for a drink soon! Here's the thing about being on sabbatical. Sometimes you can just say yes to a slightly ridiculous notion and run with it. I woke up one morning in December with the idea of making some little felt birds. 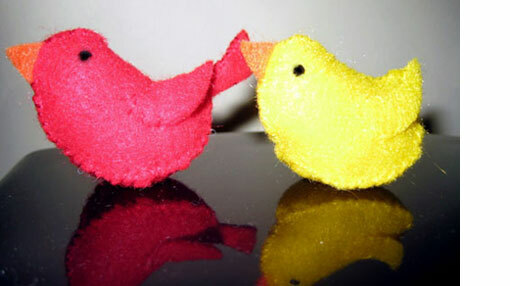 3D, fully hand sewn tiny birds. I've no idea where the notion really came from, but the form of them was pretty clearly worked out in my mind before I even got out of bed. The first one I made was roughly the right shape but way too big. Which is a strange thing to say when you consider that I had no idea what I was making the bird for in the first place. The second one was much (much!) smaller, but too fat and a bit lumpy. The third one, like porridge for bears, was just about right. Patten refined and with tail options, and with the correct stuffing medium in hand, I started sewing little birds. And sewed, and sewed, and sewed. With February just about over, it is appropriate that I have finally (finally!) finished my February Blues project. And it has been a long time coming. I'll cut to the chase. Here it is, an Alabama Chanin inspired skirt. This is a self drafted 4 panel A-line boot length skirt made in French Terry for winter warmth. 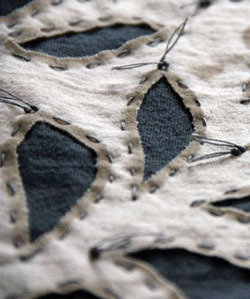 The surface design was stencilled onto the same fabric, cut out, arranged and painstakingly hand stitched in place. And that's where all the wintery days of the past month have gone. The hem is finished with dyed-to-match cotton lace - that I did not crochet myself. This work is very different for me. Not only is it far more labour intensive that most of my projects, it is also by far the most decorative work I have ever done. I don't usually even wear patterns, but the idea for this outfit popped into my head pretty much fully formed. So what could I do but make it? I had to get it out of my head somehow. Following on from my previous post, I have also been working on some samples of the appliqué methods shown in the lovely book Alabama Studio Sewing + Design: A Guide to Hand-Sewing an Alabama Chanin Wardrobe by Natalie Chanin. I have a little experience with reverse appliqué - which is when you have two layers of fabric, a stitched pattern and then cut away some of the top layer to reveal the bottom layer. I remember doing some sweatshirts with this, way back in the 80's. Yes, that was in the previous century. which shows it very well.